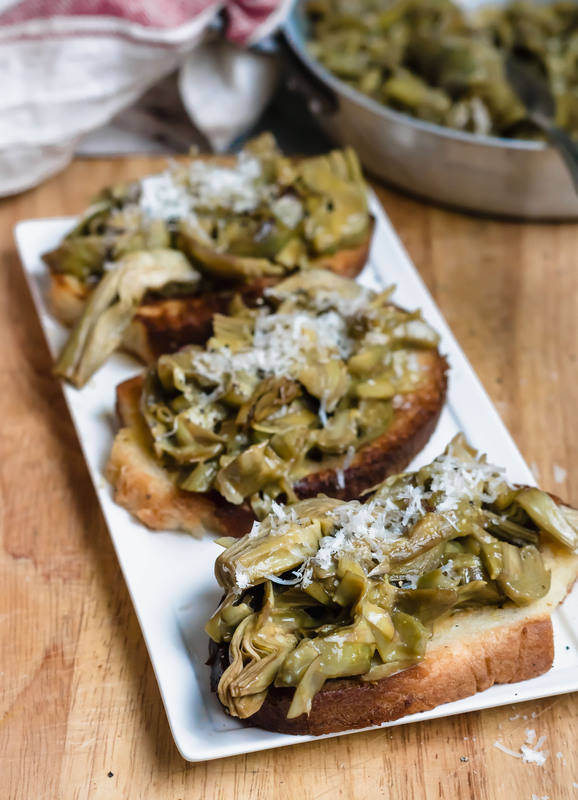 This is the recipe my granny used to prepare as soon as huge boxes of fresh artichokes arrived from our farmer of Albenga (btw in Albenga the best ever Italian Riviera artichokes grow!). Before starting to clean for the whole afternoon tons of artichokes that would have then quickly blanched and put in the freezer “for later”, my granny used to slice 5 or 6 of the biggest artichokes on the fly, drop them in a pan with extra-virgin olive oil and garlic and made them quickly stew. On the side, she beat the eggs just arrived as well – still dirty with chicken coop and wrapped in newspaper – adding two tablespoons of Parmesan cheese, minced fresh marjoram, the juice of half a lemon, salt and pepper. 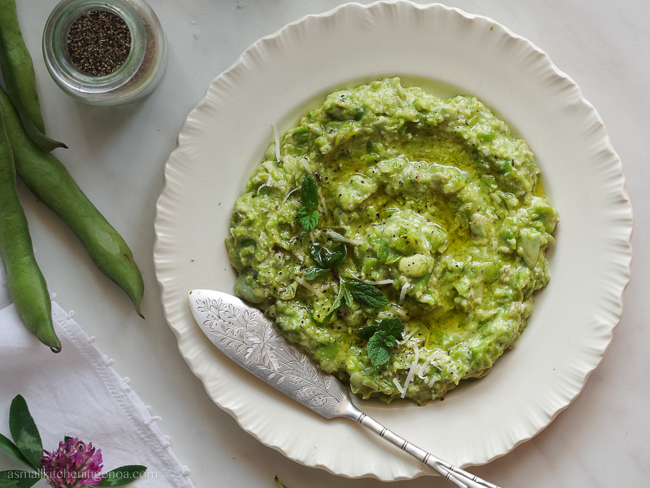 When the artichokes were just tender, she poured the eggs into the pan, she stirred quickly to make them like a cream and called us to the table. 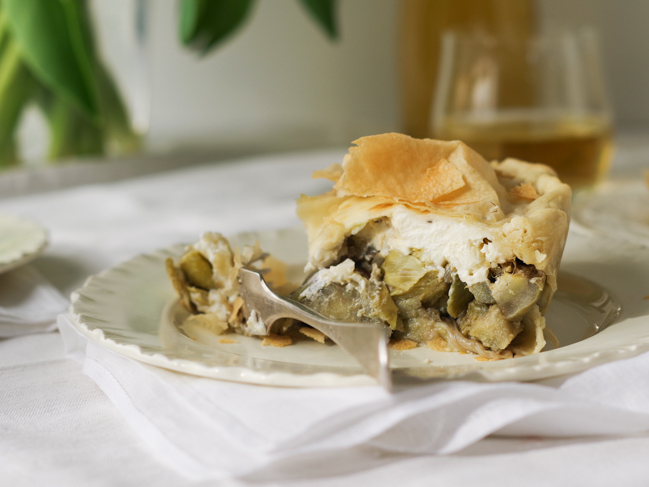 Separately he had already browned some slices of bread slightly soaked in milk: a greedy base to enhance even more her fresh artichoke “fricassea”. 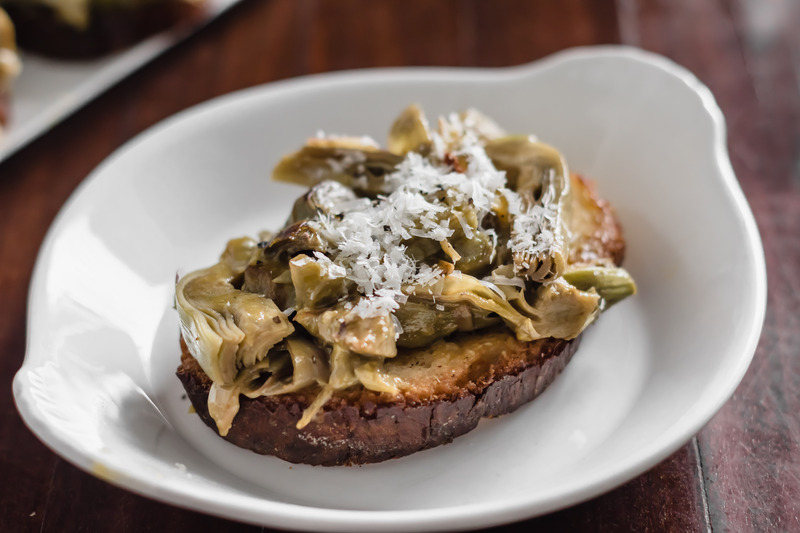 Indeed this is the traditional name of the recipe: “Fricassea di Carciofi (artichokes fricassea)”. With “fricassea” in the Italian Riviera cuisine we mean a range of dishes made of stewed meat (preferably chicken or lamb) or vegetables (maily artichokes or roots) “strung together” by beaten eggs and lemon juice. The origin likely is the French “fricassèe”. 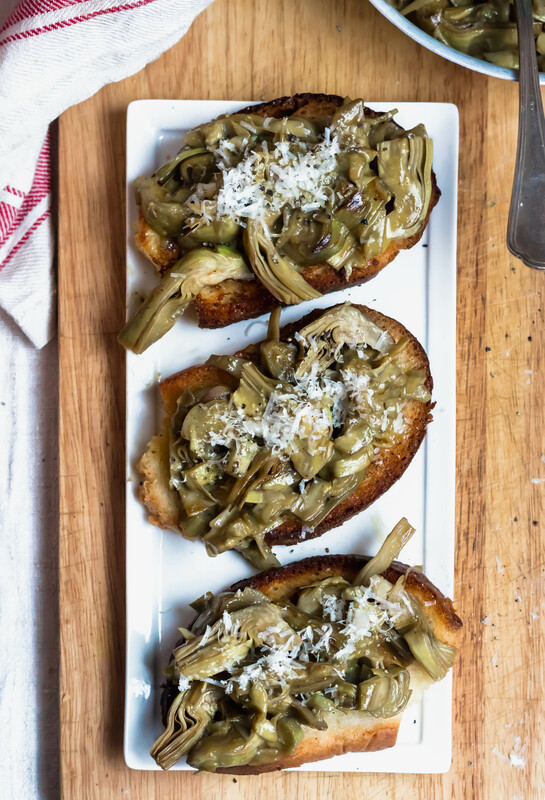 Below the recipe of my granny’s artichoke fricassea served on yummy fried bruschetta, for 4-6 people. 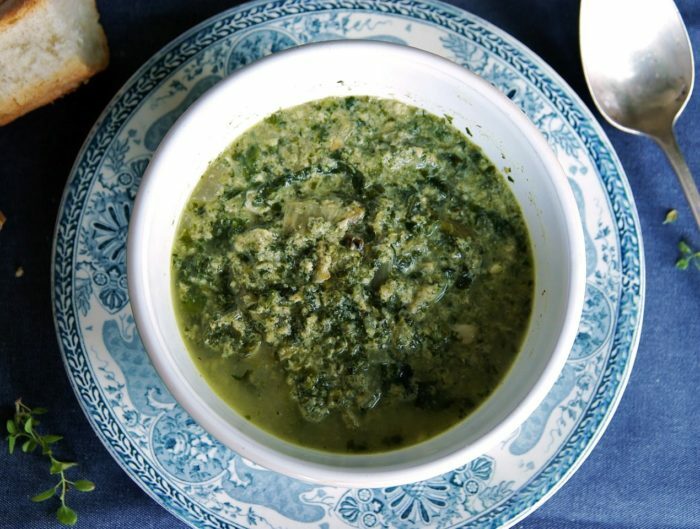 It can be an excellent main dish for a light lunch or an appetizer or, with mini croutons, it can accompany an aperitif with white wine (better if a bottle of DOP Pigato from the West Italian Riviera). Clean the artichokes from the hardest leaves, remove the thorns with a clean cut and the hard peel from the bottom. Divide them into quarters, remove any beards inside and cut them into thin slices, dipping them in a bowl of water where you have squeezed the juice of half a lemon. 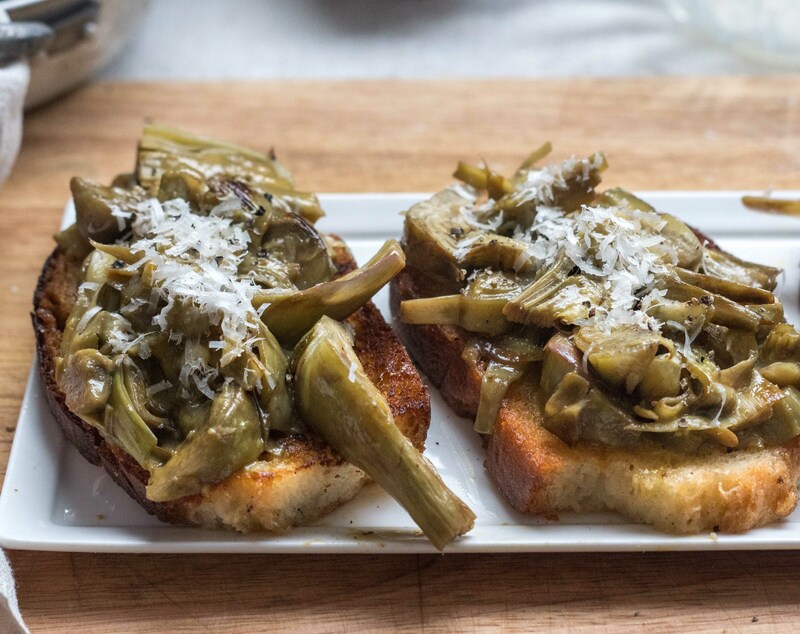 Clean the stalks of the artichokes from the outer rind, cut them into thin slices and immerse them in the water as well. Heat 3 tablespoons of oil in a pan, brown the crushed garlic cloves, then remove the garlic and pour the well-drained artichokes. Stir, add salt and continue cooking, at moderate heat and with the lid, for about a quarter of an hour. If necessary, wet with some water. Meanwhile in another pan heat the remaining 2 tablespoons of oil. Pour the milk into a flat dish, quickly deep the slices of bread on both sides and brown them in the pan turning them, until they get golden on both sides. Put aside. Beat the eggs with the cheese, the marjoram, the juice of half a lemon, salt and pepper. 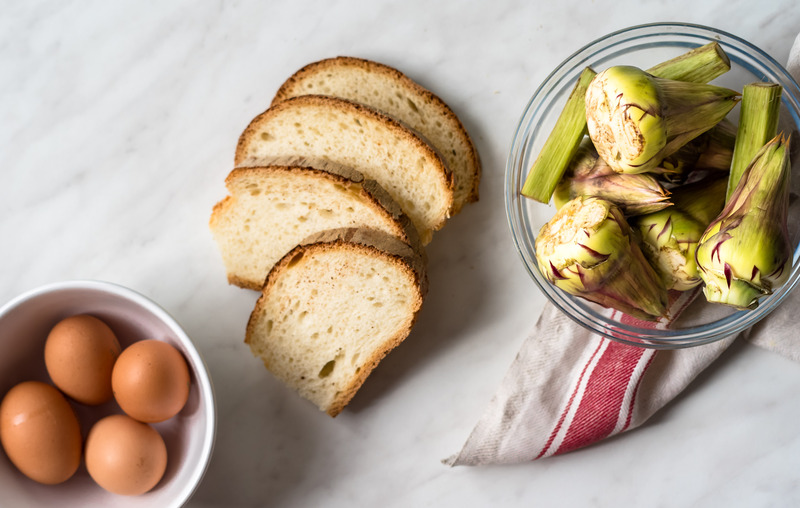 When the artichokes are tender and almost dry, pour the beaten eggs into the pan, stirring constantly. Keep the heat to a minimum and continue cooking for 2 minutes, always stirring, until the eggs become a cream. Serve on the slices of bread, sprinkle with grated Parmesan and pepper.